It seemed like such a long time to have things happen with the house but it finally did and we moved this past weekend. I remember a while ago thinking I’d have so much fun with a farewell post that rattled off all the reasons why I’m glad we’re leaving and “woo-hoo”ing and all that but I don’t really feel that way anymore. 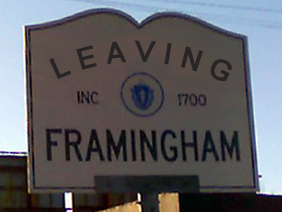 There were a lot of awesome people I met in Framingham, and they really made living there special. I didn’t like my stupid neighborhood, the crime, traffic/congestion, disappearance of small business, etc… But from this blog I’ve met people who became friends and effected my life in positive ways like becoming a town meeting member, working at the History Center, and having the amazing opportunity to run the Boston Marathon. I don’t think I would have even become a runner if I hadn’t moved to Framingham because of how my introduction to it and the marathon opportunity happened. I’m grateful to my friend Lisa who really started the chain of events that lead to that and other positive experiences. I’ll be keeping this blog up as a reference in case someone may find it useful (the reason why I started it) and will be able to update it if I meet friends for dinner at a new place there or notice something while driving through. So instead of my original planned rant, I’ll just say thanks. I noticed the old and long time-vacant Desmond O’Mally’s/Metro 9/Big Papi’s is finally getting demolished. I have no idea what will be replacing it, I only found a permit from the town for demolition and nothing else, but I think it’s a good idea to just level the building and start over. 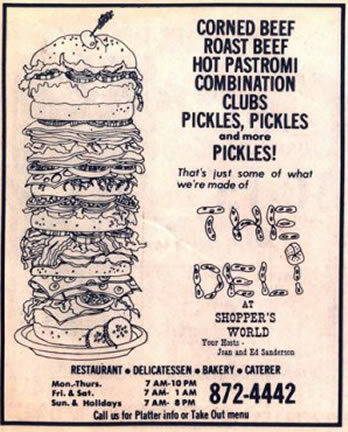 I know they moved to Natick years ago but Joan and Ed’s Deli was an important part of the old Shoper’s World. I worked there when it was at SW and remember when I was late for work running up the ramp and bringing home pickles for my mom at the end of the night. Anyway, they had the best knishes around and their food will be missed! 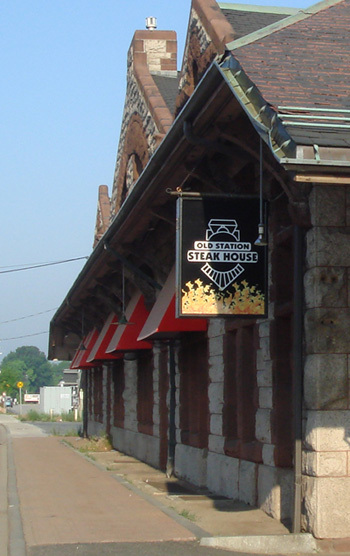 The former Old Station Steakhouse had changed hands and became Cafe Belo. I never went to Cafe Belo but I think it was open for a year under that name. I know they had problems with underage drinking so I’m not sure if that’s why they closed but I’m still hoping someday it will re-open as something like Ebenezer’s but something different would be fine too. We have plenty of Brazilian buffets around here so another type of restaurant would be good to mix up the variety in downtown. I guess we’ll just have to wait and see what happens! 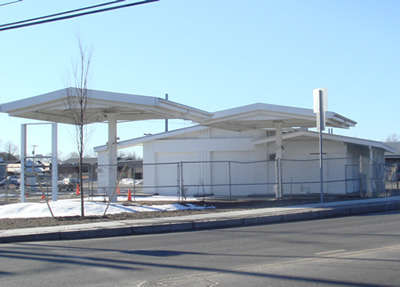 Another business closes on Franklin St.
It’s been a couple of weeks now, but the Shell Station at Sad Plaza on Franklin St. Closed, got boarded up and is rumored to be demolished. I can’t say I ever went there because they were a little on the pricey side, but it did add a little life to the plaza and the intersection. I don’t know if technically it’s on the lot belonging to the plaza owner. I’d like to think this would just make more of a case for a developer to take over the plaza with all this available space (which includes the bounty of empty shops behind the gas station) but we’ll see. Only 4 more stores to close until it becomes completely vacant. 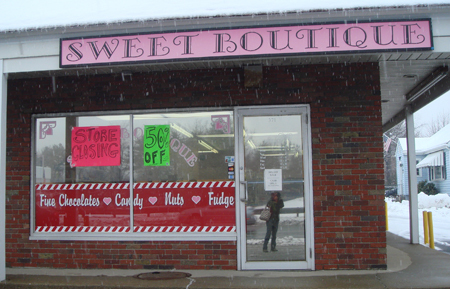 Today I stopped in at Sweet Boutique to say goodbye because they’re closing up shop at the end of the month. I didn’t go in there all the time but when I did, I ended up talking with Jean, the owner, or her daughter Michelle for a while and they are both such incredibly nice people. When I walked in, Michelle’s husband who owns the Bedrock Comics next door, recognized me and cheerfully teased me that I finally got a new camera. I thought it was funny that he remembered how crummy my camera was over 5 years ago when I posted about his shop. We had a nice talk about Framingham and what it’s like for small businesses in town. It’s not easy. I understand there are rules and everything, but from doing this blog and talking to a lot of small business owners, I hear a lot of anguish they get from the town with permits for signs and flags just to let people know they’re open. Framingham can be a really tough place to run a small business and compete with the big businesses, a lot of which are “exempt” from the same rules to hang the same types of signs. It can be really frustrating. 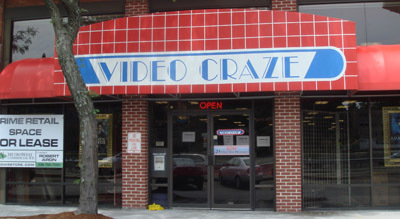 It’s not all town-related reasons that they’re closing. Online vendors and the fact that specialty candy is available even at places like Marshall’s and TJ Maxx have been slowly effecting business since they started 6 years ago. Goodbye to a really nice small business and good luck to Jean and Michelle!